Gerard Eftink is a partner of Van Hooser & Eftink, P.C. Gerard was born and raised on his family’s farm in southeast Missouri. During his 30 year career, Gerard has handled legal hearings in thirteen different states. 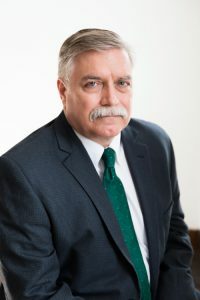 Gerard has a wide and diverse range of legal experience, including presenting oral arguments in the Supreme Courts of Missouri and Kansas and four different federal appellate courts. He has handled jury trials, bench trials and agency hearings. In addition, Gerard has appeared before legislative bodies, assisted in briefs filed in appellate courts, and appeared in municipal court. In his practice, he handles litigation as well as advising clients, preparing documents on various matters concerning real estate, contracts, estate planning, domestic relations, and small business matters. Gerard is also a trained mediator. Gerard is the president ex officio of the Cass County Bar Association. He has been married to his wife, Martie, since 1980, and together they have two children.